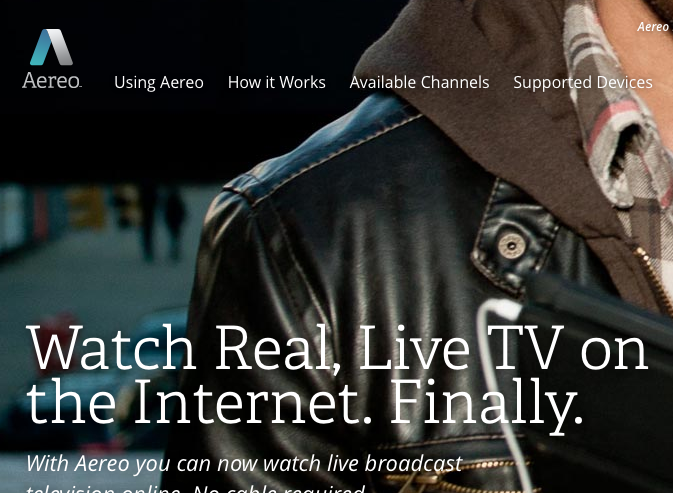 Aereo uses an array of tiny, dedicated antennae to stream over-the-air TV feeds to online subscribers. We’ve told you before about the lawsuits filed against Aereo, the startup service that charges customers a monthly fee to stream broadcast networks over the Internet. Now comes news that TV execs are genuinely considering making their broadcasts unavailable to the antenna-using public rather in an effort to stop Aereo and others from selling their signals. First came the Reuters interview with Garth Ancier, who has been in charge of programming at NBC, the WB, and FOX. He claims that the networks are seriously considering the possibility of pulling the plug on their over-the-air signals if the networks’ lawsuits against Aereo fail. At issue is whether or not Aereo is illegally retransmitting network signals. The broadcasters claim it is, but Aereo believes it is getting around retransmission concerns by having an array of tiny antennae, each of which is dedicated to a specific customer. Thus, the company asserts, it’s doing nothing more than connecting a customer to an antenna to access TV; no different than having an antenna on your roof. Obviously, the networks disagree and say that Aereo is acting like a cable or satellite provider, which would usually mean it would pay for the right to retransmit the network feeds. The issue is still being litigated, with a U.S. Circuit Court of Appeals recently ruling that Aereo be allowed to continue operating while the suit is pending. Now News Corp.’s Chief Operating Officer says his company could pull its broadcast network, FOX, from the free airwaves if the Aereo suit fails.